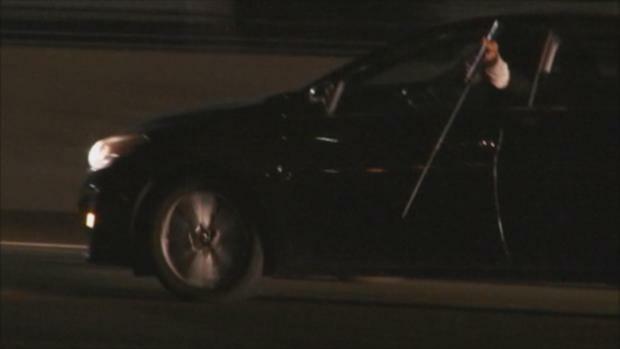 A low-speed, three-hour chase through two counties ended in Oakland early Wednesday with the arrest of a driver initially suspected of being under the influence who was spotted waving a long pole from his car, according to the California Highway Patrol. 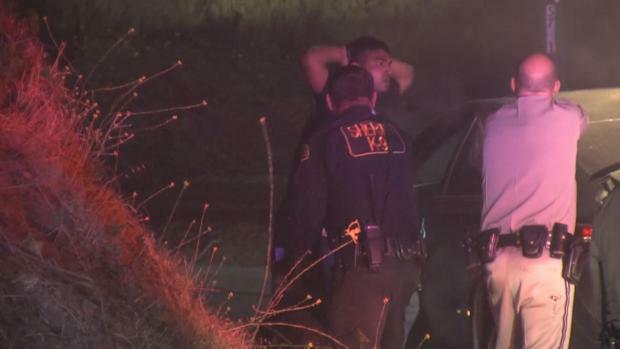 The man, identified as 28-year-old Abdul Henan Zahid of Berkeley, was arrested near Tunnel Road and Bay Forrest Drive near the Caldecott Tunnel in Oakland about 5:15 a.m., the CHP said. He was booked on suspicion of evading police and DUI, the CHP said. Sgt. John Koven said the Zahid was taken to the hospital after he was bitten by a K-9. The driver was also "sweating profusely" and shows signs of "possible intoxication or mental disorder" when he was arrested. Before his arrest, video at the scene shows a police dog barking at his black Toyota Avalon, and the sounds OF bean bag shots being fired. Officers shouted: "Get out of the car with your hands up." The dog continued to bark as a team of officers surrounded Zahid and eventually got him to put his hands behind his head. Meanwhile, Zahid's car started to smoke, prompting officers to cough and move away from the burning vehicle. The Toyota's tires burned up after they ran over spike strips. Later, Zahid, who was wearing an "Enjoy California" T-shirt, was seen yelling and acting angrily with officers while strapped into a gurney and being loaded into an ambulance. 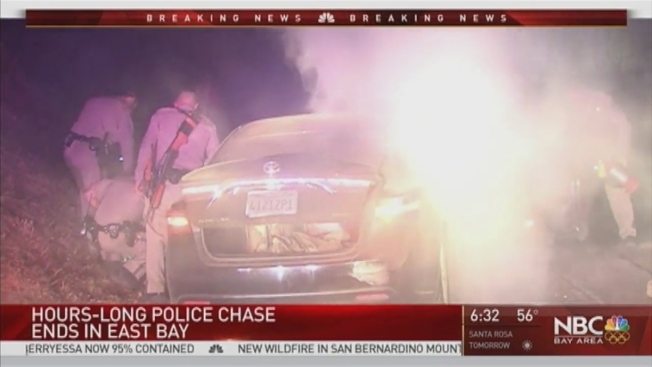 The chase first began in Menlo Park about 2 a.m., according to a CHP records of events. When police there tried to pull him over on suspected DUI, he wouldn't stop, and the CHP was called in to help. CHP officers started following the car at low speeds of about 25 mph at U.S. Highway 101 and Marsh Road, which continued across the San Mateo-Hayward Bridge onto northbound Interstate Highway 880, to Interstate Highway 580 and finally near Highway 24.